You are here: Home » Blog » Why join our board? Written by Nicola Le Gear – Board member at LMHA since 2017. Stay at home parent to 3 young children. I started volunteering with LMHA in June 2016. At first I wanted to use my skills in a productive way to give back. However, it was not long after this that I joined the Board of Directors. Serving on the Board of Directors of an organization that I admire may be one of the most rewarding and valuable decisions I have made. 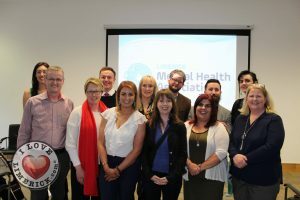 We currently have 3 open positions on our board, but first let me tell you about my experience volunteering on the Board of Directors for Limerick Mental Health Association. When I considered volunteering – at first it was just the idea of volunteering that appealed to me. However, when searching I noticed that Limerick Mental Health Association needed a volunteer to help develop their website. This could not have suited me better. I had recently left full-time employment in a large blue chip company where I managed a team who were responsible for the online presence of many organisations. I felt like I had a lot to offer, But more importantly I also felt very strongly about helping any charity that focused on mental health, Particularly one that helped people recover and cope better with life’s ups and downs. Why did I join the Board of Directors? It is very fulfilling personally to be giving your time and expertise for free. Especially to a charity, and above all to one that means something to you. It is very rewarding to know that even the smallest thing we decide to do as a board can impact someone’s life – hopefully in a positive way. Moreover, volunteering your time to a sector that is dedicated to social good is in itself a hugely rewarding experience. Don’t get me wrong, it can also be demanding being on the Board. Particularly when we all have busy lives to juggle. However, I have noticed that the more attention and effort I put in, the more I get out of it. My advice to everyone and anyone is that if you want to feel good about yourself – you need to volunteer! Surprisingly it is not just giving back to society – volunteering helps society give back to you. It is also gratifying to know that unlike my previous roles, I am not just using my skills for material / company gain, but to make a real difference, and help society as a whole. It keeps my toes in the water for when I return to full-time work. In the future, there won’t be a huge gap in my CV. It will show that I have been active the entire time I was at home with my children. It also gives me a reason to maintain business contacts, and stay up-to-date on industry trends. It allowed me to meet and interact with interesting, passionate people outside of my normal sphere. Not everyone will join a non-profit board – but those that do have decided to not just say they are interested in helping a charity but are actually doing it. Launch of Limerick Mental Health Association’s Strategic Plan at Engine Limerick. Picture: Zoe Conway/ilovelimerick 2018. All Rights Reserved. It gave me a key role in strategizing. When you serve on the board, you have the honor, challenge, and responsibility of understanding how everything needs to work together for an organization to accomplish its goals. It’s very exciting. In the last year we have finalised our strategic plan for the next 3 years. It is invigorating and a privilege to consider all aspects of an organisation and shape how it will work and look for the foreseeable future. Your voice is likely to be heard – and it has impact. You’ll hear the impactful voices of others, too. If you join a board, you’ll likely bring your own valuable talents, passions, and areas of expertise. You’ll open eyes and your eyes will be opened. We are a team of enthusiastic, caring volunteers – check out our profiles. We are looking for 3 new people to join our Board. Check out our current vacancies for more information. This entry was posted in mental health, volunteer and tagged Be active, be well, community, Connect, Keep learning, limerick mental health assocation, mental health by lkmentalhealth. Bookmark the permalink.